We all know what they are. Those scary, vibrant and almost impossible to remove squiggly lines in the skin that appear after giving birth to children or gaining and losing weight; stretch marks. Luckily, there are literally hundreds of thousands of creams on the market for the treatment of stretch marks. A number of these have proven to be very effective in preventing or removing stretch marks. Stretch mark creams can range in price from a few dollars to hundreds of dollars. The ingredients found in stretch mark cream can range from cocoa butter to chemicals with so many syllables that I won’t even attempt to repeat. Don’t worry, we’ve done our research to identify the most effective stretch mark creams in the market today. 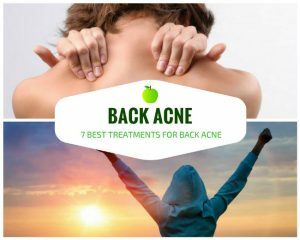 1 What are the best stretch mark removal and prevention creams? 15 Is there a difference between pregnancy stretch marks and other stretch marks? 16 Do Stretch Mark Creams Really Work? 17 Do These Creams Actually Work? What are the best stretch mark removal and prevention creams? So, which stretch mark creams are best? Which stretch mark creams are worth the money? And most importantly, worth the time? It is difficult to get a definitive answer to these questions because there are so many factors that go into the equation. For example, how old are your marks? 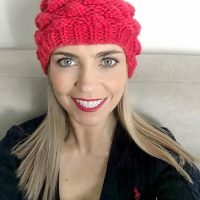 Are the creams being used preventatively or after the fact? Are you exfoliating before use? What kind of lifestyle do you have? Are you being consistent with application? For the most part, stretch mark removal creams are not going to completely get rid of stretch marks. They can, however, reduce the appearance of stretch marks so much so that they are barely visible. So, which stretch mark creams are most likely to minimize the appearance of stretch marks? There are certain brands of stretch mark cream whose names come up often on the internet and in women’s magazines. 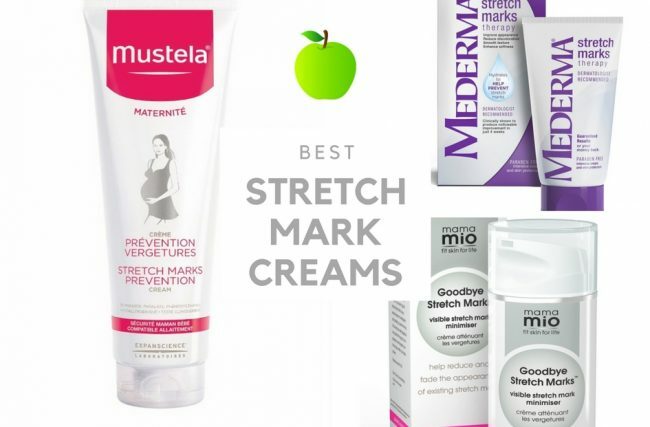 Taking into consideration important variables such as before/after results, customer reviews and value for money, we’ve come up with a list of the top 10 stretch mark creams available in the market today. Keep in mind however, it’s very difficult to provide a one-size-fits all approach to stretch mark cream. The type of cream that best suits you will vary depending on your circumstances. Because of this, we’ve highlighted the best stretch mark creams for different types of people and circumstances (pregnancy stretch marks/sensitive skin/stretch mark prevention, etc) to help you identify the best solution for you. Currently one of the most potent and effective stretch mark creams in the market. Strivectin has clearly done it again with another five star product. Formulated with an interesting ‘wrinkle repair complex’, this product is said to target collagen 3 or ‘youth collagen’ which is important for skin elasticity, strength and overall firmness. It is also packed with a hydrating moisturizer which further helps to increase skin elasticity and reduce the risk and appearance of developing stretch marks. The cream itself is non-greasy and can double up as an anti-wrinkle cream (some reviews suggest it has also helped with acne). It has a 4/5 star customer rating on from over 350 customer reviews. 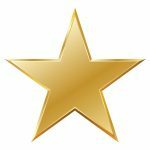 This is a fantastic review rate given that reviews for beauty products can be very critical (especially if they have not given the product enough time to work). 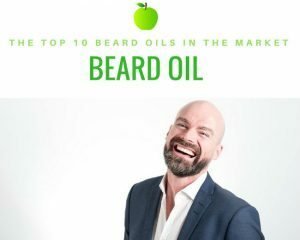 Backed by a number of clinical studies and coming with a 100% satisfaction guarantee, you can also feel confident giving it a go without the risk. Stretch marks are caused by tearing and your skin is especially susceptible during pregnancy. If you’re pregnant and looking to prevent stretch marks – look no further. Mama Mio has done it again with it’s amazing shea butter based Tummy Rub Butter. In our opinion this is the best preventative stretch mark cream out there. It’s unique combination of ingredients helps it to increase skin moisture and elasticity which allows the skin to stretch further without leaving behind those nasty scars. It has won a number of prestigious awards including the Harpers Bazaar ‘Best of the Best’. 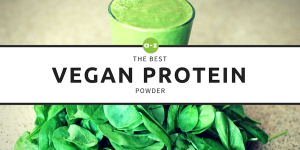 Some of the active ingredients include avocado oil, coconut oil, folic acid and omega 3 fatty acids. 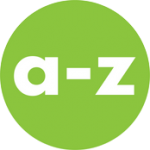 It also avoids nasties like parabens, petroleum and colorants. It is safe to use during pregnancy. The only downside is that you may need to apply frequently. 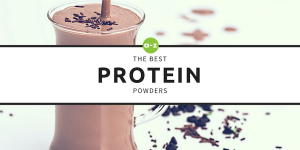 We recommend getting a supersize if possible as you’ll get much better value overall. Truly one of the most potent stretch mark creams. Interestingly this product is clinically proven to visibly reduce the appearance of stretch marks. It’s free from parabens, petrolatum and synthetic fragrance. In contrast with Mederma above, it is safe to use during pregnancy. It can also be used on both new and pre-existing stretch marks. The best part about this product is that the cream is ultra concentrated. So if it’s important to get rid of your stretch marks fast, this might be a good option for you. With consistent application, some customers see results very quickly (within 4 weeks) – if you apply a good layer to your skin 2-3 times a day – according to reviews. Mederma Stretch Mark Therapy, like all others is recommended as a preventative cream, however it can also work as a removal cream. It can be used during certain trimesters of pregnancy and after the appearance of stretch marks. 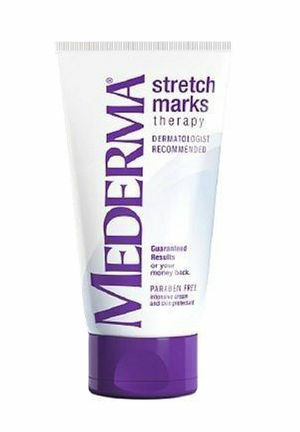 Mederma is the #1 pharmacist recommended brand for stretch marks and has been clinically tested. It was originally a product for the treatment of scars so the technology used in their stretch mark cream is similar to that of their scar removal gels. 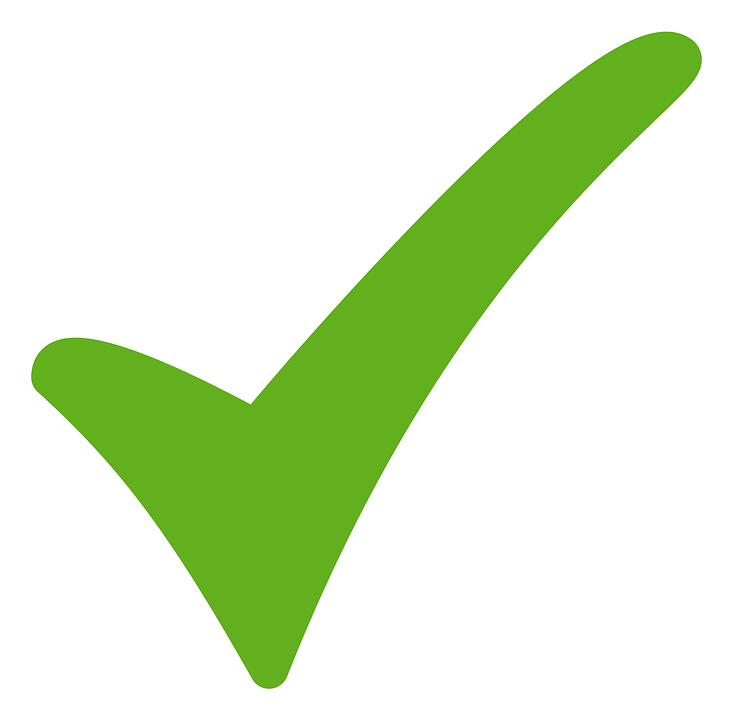 In a survey conducted over 12 weeks, 76% of respondents said that they were satisfied with the results. It has been shown to increase the moisture content of the skin and improve its elasticity. Mederma stretch mark removal cream tends to do better than most at removing older stretch marks as well as preventing new stretch marks from forming. We recommend buying a pack of two as it may take a few weeks to start seeing visible results. It comes with a money back guarantee so if you don’t see results in twelve weeks you can usually get your money back. It Works! Stretch Mark Cream is a product in a skin care line that is most commonly known for their wraps. It works stretch mark cream is composed of namely botanical ingredients and claims to be non-greasy and restore a youthful appearance to skin. Customer reviews of the product seem to be mixed, however there are more positive reviews than negative. A closer look at the positive reviews reveals that the happy customers are usually very happy. Most claiming to have experienced dramatic improvements in stretch mark reduction or prevention. The website has a disclaimer stating that the cream is not intended to prevent or cure any skin condition but is purely cosmetic in nature. The before and after pictures on youtube are fairly remarkable. Although there is little information about how long after the onset of the stretch marks the cream was applied. Overall, if used persistently and as directed, the It works stretch mark cream should help to diminish the appearance of stretch marks. Consumers are particularly impressed with the results that they have seen on the skin around the thighs where they have had “stubborn” stretch marks. Mustela Stretch Marks Cream is lightly fragranced and once again; a prevention cream. This cream is geared toward the treatment of pregnancy stretch marks and like its competitors, claims to improve skin elasticity. Mustela stretch mark prevention cream is composed of namely natural, plant-based ingredients like avocado and ‘galactoarabinan’ – a patented ingredient from the Larch tree. This outer space, Doctor Seuss sounding ingredient is intended to super charge collagen production. The company claims that a whopping 96 percent of women who used this cream preventatively did not develop stretch marks. Impressively it scores 4.3 out of 5 stars on Amazon with over 100 customer reviews. For the price, this cream is definitely worth a shot since the claims are so remarkable. The cream is also fast absorbing, hypoallergenic and free from parabens. It has been clinically proven to be safe for both mother and baby during pregnancy and while breastfeeding. Dermology Stretch Mark Cream is up there in the top three as far as the before and after photographs go. In some cases stretch marks are practically invisible after using this product. Deep crevices and vivid purple red wrinkle lines are diminished to almost nothing. Once again, there is little to no information on how old the marks were or how consistently the consumers in the photographs were using the product. 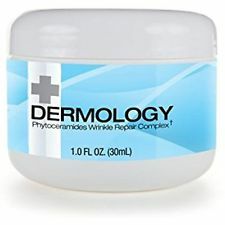 The ingredients in Dermology stretch mark cream are quite similar to the ingredients in Revitol. Vitamins, squalene oil and grapefruit seed extracts help to speed up collagen production and restore skin’s youthful resiliency. Dermology stretch mark cream is marketed as a prevention cream also and therefore, will have the best results when used before the onset of stretch marks and as soon as possible after the onset of stretch marks. 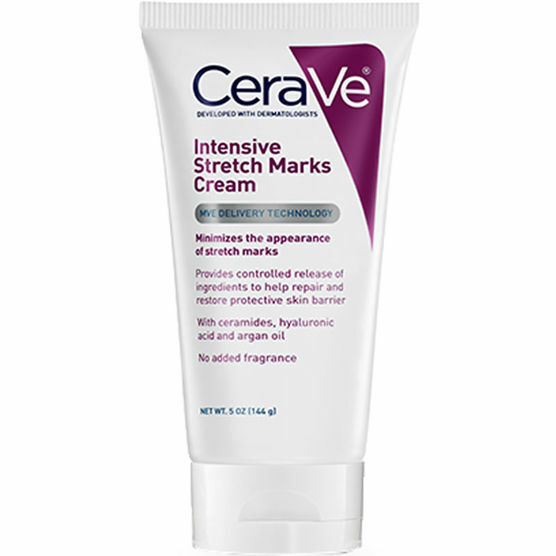 Cerave Stretch Mark Cream is ideal for those with sensitive skin. It also has great results with reducing the depth of the stretch marks. This stretch mark cream has definite benefits in its own right. It is gluten free, hypoallergenic, is not tested on animals and is fragrance free. It’s MVE delivery technology means that it does not require as frequent application as most other creams. The 5 ounce bottle claims to contain skin ceramides, hyaluronic acid and argan oil and was developed with the support of dermatologists. Cerave is also more affordable relative to others. Click here to access Cerave Stretch Mark Cream on Amazon’s website. 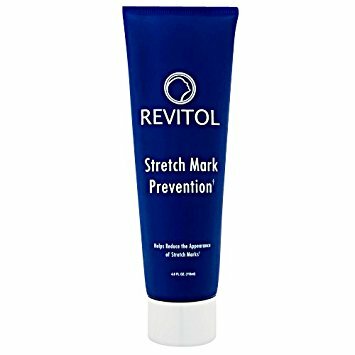 Revitol stretch mark cream is labeled for prevention of stretch marks. However, women who used this cream after the appearance of stretch marks claim that the cream does also work to help stretch mark removal. Revitol can be purchased directly through the manufacturer or on Amazon. Revitol is supposed to increase collagen production and hence, create more skin cells to be able to stretch to new proportions. The Revitol cream itself has vitamins and natural extracts such as grapefruit to remove dead skin cells and encourage new cell regeneration while strengthening the tissue. The before and after photos for Revitol are very impressive. In some pictures, deep indentations seem to be smoothed out and the bright red or silvery crinkles are faded to almost match the skin’s original color. 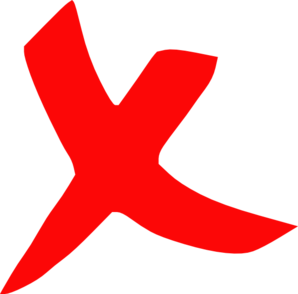 Mainly, consumers claim that their red stretch marks (newer ones) disappeared and no newer ones appeared. However, the lighter and older ones were not as likely to fade. There weren’t many complaints about odor and most people suggested that the scent was moderate to pleasant. Absorption of the Revitol stretch mark prevention cream seems to be fairly average; not too greasy but not remarkable. The 4 ounce bottles are unrealistically small and do not go a long way so I would advise one to buy a few at a time if they find that it works for them. 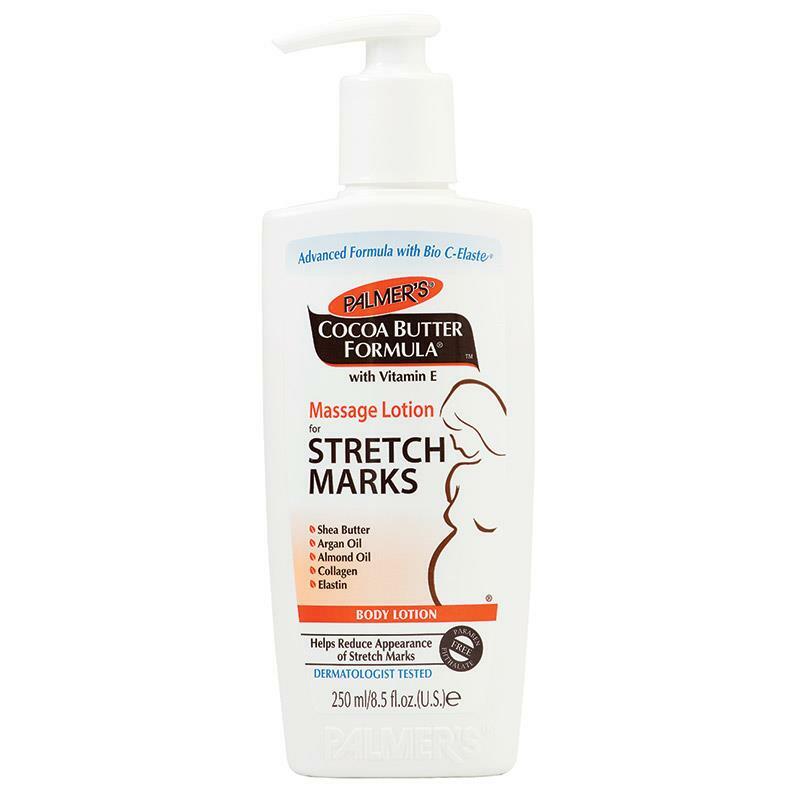 Palmers Cocoa Butter products are the most time-trusted products on the market for the treatment of stretch marks. The product line includes stretch mark creams, stretch mark lotions, stretch mark oils and even stretch mark butter sticks. Pricing is very reasonable and product availability is huge. 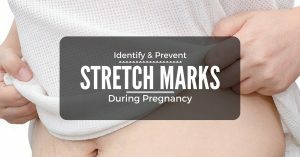 These stretch mark creams can be bought online at Walmart, Target and your local drug store. I wouldn’t be surprised to see the stuff at a local gas station. Palmers has expanded their standard ingredient of cocoa butter to include vitamin E, shea butter and Bio c-elaste, “…a powerful combination of collagen, elastin, centella asiatica, sweet almond oil and argan oil”. For the natural, organic consumer; there are several raw cocoa butter products on the market as well that are free of mineral oils and refined chemicals. Palmers almost always tops the list. Consumers tend to have better results when they use a stretch mark prevention cream rather than trying to deal with the stretch marks after the fact. 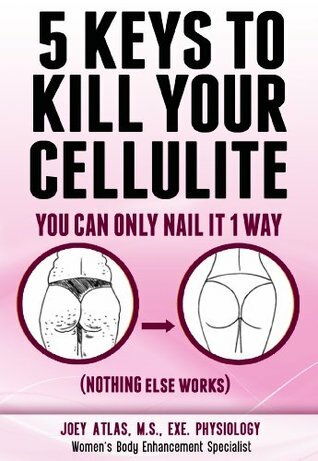 This is good in theory however, in many cases a person is not going to know that their child’s growth spurt in teen years or weight fluctuation is going to cause those unsightly stretch marks. A cream like Mustela would be great to use during and after pregnancy for best results. If skin is moisturized and in peak condition for collagen production then one is far less likely to have stretch marks. That being said, genetically some people are just more prone to stretch marks than others. All of the above products have given some group of consumers’ results. A person who is desperate to rid themselves of stretch marks might want to start with a less costly stretch mark cream and work their way up to the more expensive stretch mark creams until they find something that works for them. Remember, not all skin is created equally. Diet, exercise and lifestyle can all have an impact on how difficult it will be to remove stretch marks and the severity of the stretch marks. Is there a difference between pregnancy stretch marks and other stretch marks? After much research, it must be said that there is little to no difference between the treatment of pregnancy stretch marks and non pregnancy stretch marks. This is because the cause of the stretch mark and the underlying physiology are identical. There is a major difference, however, in preventative measures. One is far more likely to use a stretch mark prevention cream during pregnancy than during a growth spurt or sudden weight change. Remember, stretch mark preventative treatment is much more effective then treating them once they have appeared. 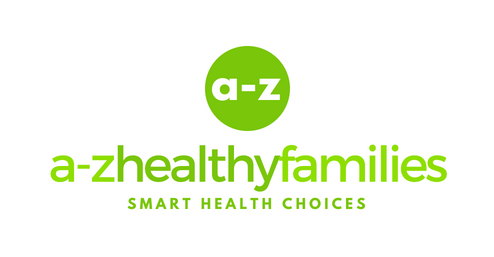 There were several reviews of other brands of stretch mark removal cream and stretch mark prevention cream in which consumers mentioned that they used Bio-oil or vitamin E oil in conjunction with the other stretch mark creams and multiplied the results (although they weren’t exactly sure if the results were from the oil, the cream or a combination of the two). 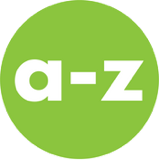 As a matter of practicality, Bio-oil and Vitamin E oil both cost less than $20.00 and are easily available at a local drug store. 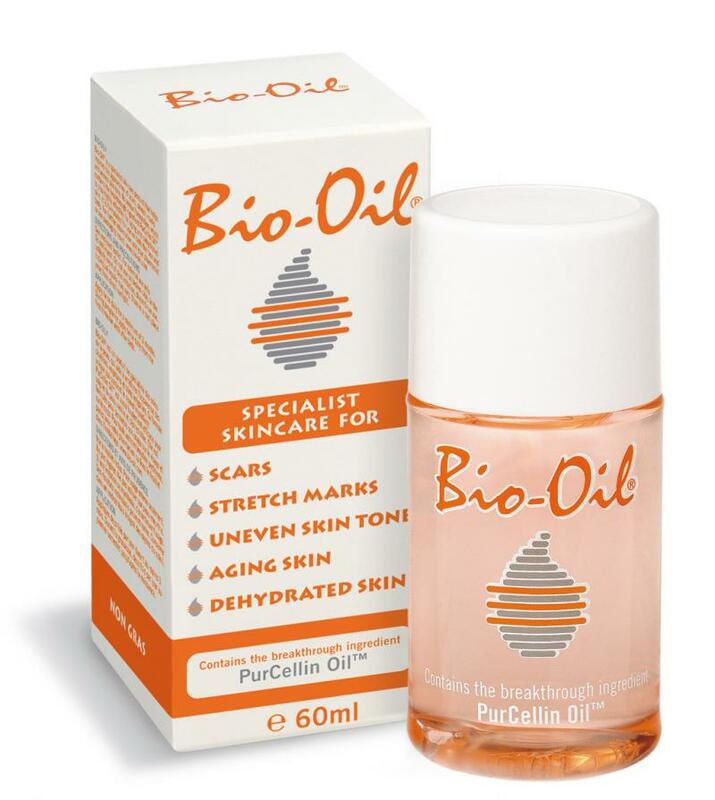 Bio-oil has even come out with it’s own line of creams as well. Most of us have some kind of stretch mark, whether it’s in several places, or just in one. Stretch marks are normal, harmless, and extremely common, but that doesn’t stop them becoming a nuisance, and even a source of unhappiness and distraction for many men and women. Stretch marks are literally what they say on the tin – they happen when the skin become stretched, often during weight gain and then weight loss, or during pregnancy. These marks can also happen during weight training, e.g. body building. It’s a myth that only women experience stretch marks, as men can just as commonly suffer from them too! Whilst we know that stretch marks aren’t dangerous and aren’t going to pose a threat to your health, they are upsetting for many, so it’s no surprise that there are countless lotions and potions on the market, claiming to reduce them and even get rid of them. Firstly, we should point out that there is nothing you can do to stop yourself actually getting stretch marks; if you’re pregnant, you can’t stop your skin from stretching, and if you’re body building, ditto. What you can do however is try and reduce their appearance, and the sooner you do it, the better. Early stretch marks will show as a purple or dark red line, and the will then turn silvery over time. It’s far easier to work with a red or purple mark than a silver one! Do These Creams Actually Work? Stretch mark creams basically work to hydrate the area, and also boost collagen development, which helps your skin cope with stretching and general youthfulness. Do they work? Some do and some don’t. If you want the truth, many don’t, but for some people stretch mark creams have been a minor Godsend. One size doesn’t fit all, but it’s important to look for quality options and to use them on a regular basis, to ensure the best possible chance of the cream working for you. The best type of stretch mark creams contain Retin-A, which helps to decrease the appearance of the mark (the redness in particular) and attempts to reverse the potential scarring through collagen boosting. You should therefore look for any product which contains retinol or retinoid, but if you are pregnant, steer clear of them as these are not safe for your unborn baby. Of course, you should combine your stretch cream usage with home methods too, to give you a better chance of eradicating the marks you have. Regularly moisturise and hydrate your skin, and consider massage too. Despite that, stretch marks are extremely stubborn to get rid of, and you may end up seeking out professional treatments, such as laser treatments, to finally wave goodbye to them. The other option? Learn to love your stretch marks as as part of who you are. Surely that’s the best choice overall? Many men and women view their stretch marks as their battle scars, e.g. through pregnancy or through a health battle. That’s an extremely healthy outlook to have. I have lot of stretch mark in biceps, stomach ,leg , batex etc . I used lot of cream but nothing reduced . I don’t know what to do . Hi Sapna, don’t fret. 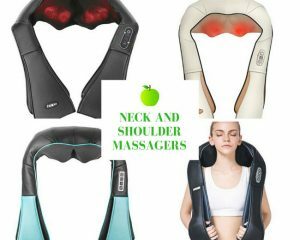 There are some great creams here that can help reduce the appearance of stretch marks on your shoulder, stomach and legs. Enjoyed reading your article! Belli Beauty also has a great stretch mark cream – I swear by it – I’ve had 3 kids!